The Risky Dice Block is Waluigi's special, purple Dice Block from Mario Party: Star Rush. In Toad Scramble, when players have Waluigi in the party, he can roll a 6 to add to the player's total roll, or roll a -2 coins slot, causing the player to lose 2 coins instead. 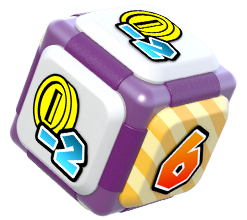 This Dice Block is most similar to Wario's Greedy Dice Block, which can subtract fewer coins, but does not roll as consistently high as the Risky Dice Block.